Manuka Honey is harvested from the flower of the wild, un-cultivated tea tree bush (leptospermum scoparium) in New Zealand. The more potent kind, Manuka Honey UMF®16 (UMF stands for Unique Manuka Factor, which represents the natural anti-bacterial action in this honey, mono-floral), is typically harvested from the North Island of New Zealand. The less potent kind, MF Manuka Honey (mf stands for multi-floral), is usually harvested from the South Island. Both strengths of manuka honey are Lab Tested before packing, labelling and being shipped overseas to Manuka Honey USA’s Warehouse, located in Orlando, Florida. Can Manuka Honey Help My Horse With Digestive or Ulcer Issues? Yes. Manuka Honey is well known for its soothing properties. If your horse is dealing with any gastro-intestinal issues, such as acid reflux, up-set stomach, constipation or diarrhea, or if you are showing, transporting, or training your horse, this is a great soother for your horse’s digestive tract, to help discourage future problems too! What Is The Best Way To Feed My Horse Manuka Honey? “Transporting” manuka honey on a piece of food, will help make the honey linger longer in the gastro-intestinal tract, to be most beneficial for your horse. 3x 1 Tablespoon a day, attached to a treat, such as a carrot or any softer food item, as a supplement, is a great way to administer, and horses love the taste. Always check with your local vet first, before giving any natural remedy to your horses, as there could be other health issues involved. There are no known side effects to eating or applying manuka honey, according to Dr. Peter Molan, only natural benefits. As gorgeous as horses are, they easily get injured on all kinds of obstacles, fence posts, nails sticking out, getting mounted or bitten by other horses, leaving deep wounds, open scars, bite marks, nail punctures, cuts, burns and other types of wounds. Manuka Honey is a natural wound dressing. How Do I Apply Manuka Honey To A Wound Or Skin Issue For My Horse? For serious wounds, make sure you have the guidance of your local veterinarian. Most wounds your horses will encounter, can be easily treated by conscientious owners. First gently cleans the wound with a sterile saline solution, or hose it with a soft water spray, apply some betadine. Spread some MF Manuka Honey onto a sterile gauze, to the size of the wound, just like you spread a medium amount of honey onto a toast, not too much, not too little. Take the gauze with the MF Manuka Honey pre-attached, and apply directly to any opening in the skin (cut, burn, wound, sore, ulcer, scar, or on top of sutures on a fresh surgery scar). Wrap bandages around the gauze, to help keep the manuka honey wound dressing in place. Change dressing once a day (or more), if the wound gets exposed to dirt, due to rolling in mud and sand. We suggest taking photos “before”, “during” and “after” manuka honey dressing application, for your own records, so you can watch the progress. If you wish to share your photos with our readers, you may forward them to Elaine at manuka@manukahoneyusa.com to share on their website and social media, in order to help other horse owners, dealing with similar issues. Once you have experienced for yourself, the natural beneficial properties of manuka honey, it may become your all-time favorite wound salve. Yes! Manuka Honey comes in various strengths, less potent and more potent. The more potent kind, Manuka Honey UMF®16+ (mono-floral), is UMF® Lab Tested, UMF® Certified and UMF® Licensed, at one of the accredited laboratories in New Zealand, such as the Hills Laboratory. So What Do Other Companies Do With Their "Manuka" Honey? Some companies are known to add clover honey into the mix, or kanuka honey, rewa rewa honey, tawari honey or any other type of honey that tastes “similar” to manuka honey, however it is not the real deal. The worst altered “manuka honey” is “produced” in Asia. They put water in a jar, a type of thickening agent, brown color, and caramelized flavor, whip it up and label that as “manuka honey”. If you don’t know who you are dealing with, you have no clue what is in the jar. Invest your hard earned money wisely, and get the natural benefits manuka honey is world-famous for. 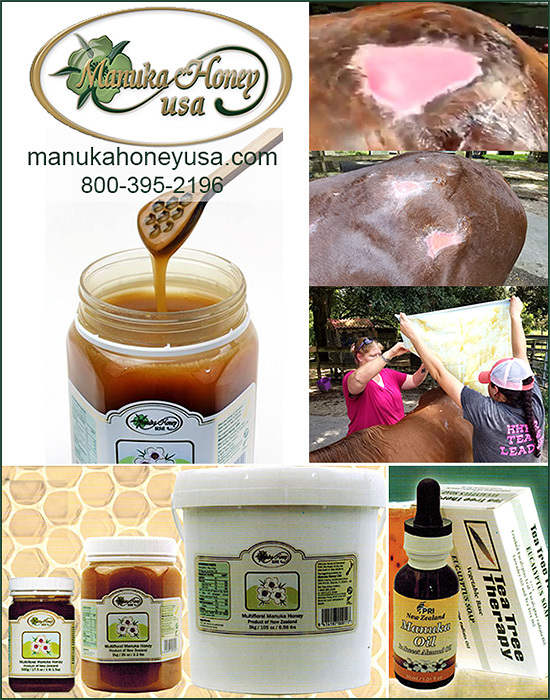 What Do Horse Owners Say About Manuka Honey From Manuka Honey USA? Yes. The world-wide most well-known Manuka Honey Researcher is Dr. Peter Molan from the Honey Research Unit, at the Waikato University in New Zealand. Dr. Molan researched Manuka Honey, together with his students, for over 26+ years, and found that it seems to naturally help destroy staph, strep, helicobacter pylori (h. pylori), MRSA and VRE wound staph infection. He was as passionate about his research, as we are helping people and animals with gastro-intestinal issues (acid reflux, esophagitis, gastritis, up-set stomach, stomach ulcer, h. pylori, IBS etc.) and external natural wound care (1st, 2nd, 3rd degree burns, open bed sores, diabetic leg/toe/foot ulcers, amputation stomp wounds, or simply a natural honey dressing on top of surgery sutures, to help resolve infection. Manuka Honey is known as nature’s “natural antibiotic”. Unfortunately Dr. Peter Molan passed away September three years ago, and is no longer able to contribute his valuable research. Other scientists are continuing research on manuka honey in various countries around the world, in order to try to break the “secret code” of this mysteriously effective “natural anti-biotic”. You and your dogs will enjoy the purest Authentic Manuka Honey at the very best possible price. To place your order over the phone today, or to ask any further questions you may have in your particular situation, our friendly and knowledgeable staff members will be happy to take the time, to answer any and all questions to your full satisfaction, before placing an order.